This is is the my first release of a Windows 10 x64 PE. This 64bit version Does NOT provide support for running 32bit programs (WoW64). All the apps below are 64bit. For this reason the portable apps menu launcher could not be installed. Active Partition Recovery Restore deleted volumes and fix damaged disks. Active Kill Disk Erase disks and volumes securely or wipe unused disk space. Active Undelete Data recovery software that allows you to recover lost, deleted, and formatted data. Opera Web Browser Fast, simple and safe way to get around on the web. Any chances for dual boot of 32 and 64? Thanks! possibly down the road a bit. Thanks for your work Gandalf. Any chance for RDP client on x64? With Connect from anywhere RD Gateway option? Is there any chance to make a 64bit with portable apps? or maybe a dual boot? Sir, you are the man. This is wonderful, is fast, and very light. Also, I haven’t had any drivers issues, which is awesome. Thanks a lot. I know a lot of people appreciate your time and work. I am currently having an issue when I try to change the screen resolution. If I go to a higher resolution than the one it defaults, then it leaves the taskbar like halfway of the monitor, and then the rest is like blue. Is this issue related to the native resolution of the default driver, or it was made this way? If your video driver was injected into the build it would likely default to the max resolution your video card uses. I feel I must say that I consider myself to be an above average ITman. I’ve built my own PE environment before, I’ve even written plugins for BartPE that nobody else ever attempted, and I have to say that your work makes me feel small. I tip my hat to you sir. I gotta agree with Crand. Fantastic job on the PE build! I’m still running a batch based menu with no GUI on my WinPE10. I’ve created scripts for automating as much as possible on my build. So functionality wise, it works pretty well… But this GUI build is pretty freaking awesome! I noticed a guy asking about Remote Desktop up there. I added a VNC option on my menu which disables the firewall and runs VNC server and displays an ipconfig menu so you know the IP. This can be done with RealVNC and a little registry hive load/unload to import the password. It’s pretty nice to be able to see the progress for images that take a long time to apply/capture. 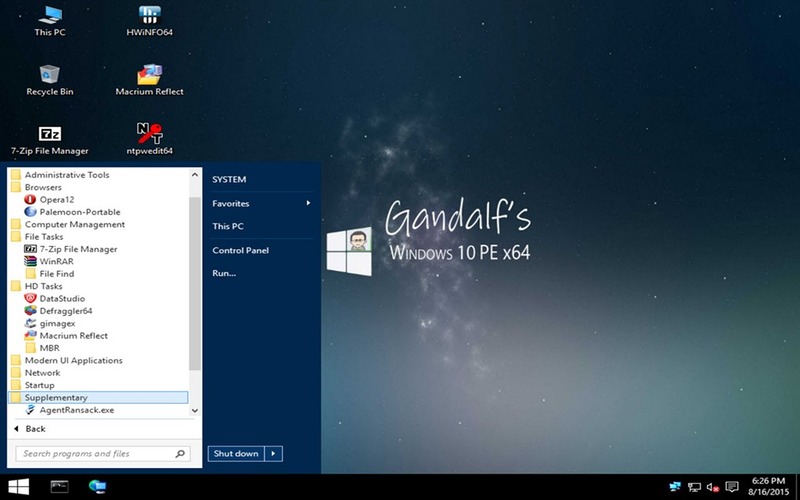 Why windows 10 Gandalf is not compatabile with NTFS formatted usb? Yes. though I personally have not tried. Users have commented they can. Especially on the 64bit. But your mileage may vary. Hi Gandalf thanks for all the hard work ! I just discovered your web site and tried your win 8.1 iso PE which is fantastic . Anyways , keep the hard work ! It is planned for down the road. Before i fire my question: Thank you very, very much for making these PE versions available! I used the Win 8 variants with great pleasure. The latest release of the W10PEx64 will not boot… I use Rufus without changing settings. Just like Venti Man says, WP10PEx64 will not boot. I use Rufus for make my USB key and doesn’t work. I will ask you, can you add Gsmarcontrol ? *** Sorry for my bad english, i’m a french man. Some users have reported it booted for them with UEFI. I’m trying with UEFI then not UEFI, the same issue: not boot. My key work perfectly with an iso of windows10 but doesn’t work with your iso. Yes it’s true my bad. Firstly, I would like to thank you for all the hard work you’ve done. I’m just wondering if when you release the next update, is there a possibility for MBAM to be on this? If so this would surely replace my current version which is 8.1 64 x 86. Also I would like to ask if in any spare time you could look at multisystems boot loader, which is what I use under Linux, and see if you have any trouble loading your disks. At the current moment I am able to load the environment but not everything. And that may just be the fact that I’m running the 64 bit version and what I’m trying to run isn’t supported. Hi Gandalf thanks for another great release. Only problem with this Win10 PE is that networking is not functional. \\192.168.1.213 is not accessible. You might not have permission to use this network resource. Contact the administrator of this server to find out if you have access permissions. I have the same problema. Anyone solve this? same problem as who? what is the prob? then you likely have an odd network card and need the driver for it. Thank for the great work. Issue I have is CDUSB.Y or ISO not Found. You can boot multiple WinPE payloads from an easy2boot USB drive. You can either boot from ISOs (but you will need to specify some ini files) or simply convert each ISO to a .imgPTN file (which also supports UEFI-booting). Updated Windows 10 x64 PE that runs 32bit apps and includes dot net and a bunch of other goodies is in the works and coming soon….. Thanks for this you truly are a wizard. Seems to work well enough with windows 7 as well! Is it possible to unlock encrypted bitlocker drives? (I can’t find manage-bde.exe). Next version to be released shortly will have bit locker and more. Fantastic work, keep up with these lifesaver builds! 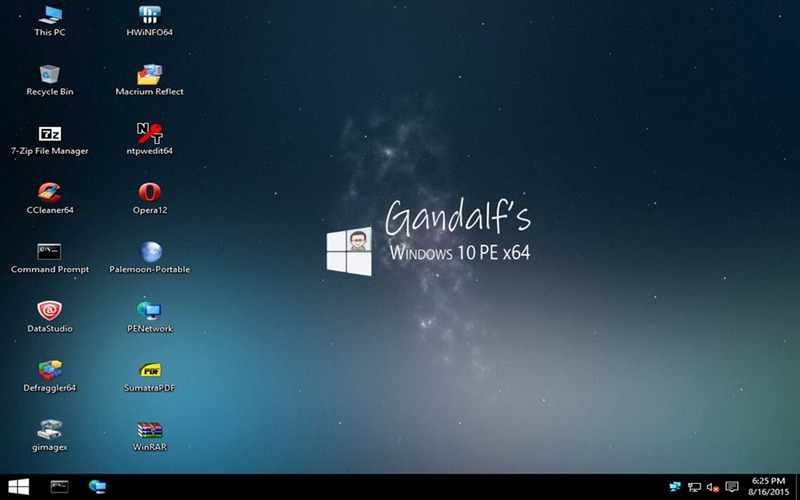 Hi gandalf50, your ISOs are great! Can you please advise on how to modify (add or remove) shortcuts from the desktop? I Checked whole ISO and wim file as well and can’t figure out this one. Thank you. They are being loaded by the flie win10pe.cfg . I wouldn’t bother I am releasing an update in a few days With a clean desktop. Just THis PC and recyle bin. i lost my boot HD for installing images and i can now do it without problems thanks to you. can i ask for some cuztomization ? how to make changes stay ? for example volume on startup sound, small stuff like that. Thanks for sharing a ready-made ISO. Some of the software is outdated. For example, Macrium Reflect is version 5.2.6444, while the latest version is 6.1.909. ChrisR has released a newer version of Win10PE_SE dated 2015-10-14. Work is now being done to improve some aspects. Expect a newer build soon. just download Win10PE_SE from ChrisR (latest build is a 207MB zip file). Extract the zip, run the builder, mount an original MS ISO of Win10, customize to your liking and press the Play button. ChrisR has just released a new build dated 2015-11-26.
does this version fix wifi? PE net manager dead? for same? No. I will be updating with the fix before Christmas. I have a problem with both x64 and x86 versions. Everything works but (Client for microsoft networks/ SMB Client). In both versions sharing client doesn’t work. No computer can be found over the network. Network is alive and kicking because pings work but sharing client doesn’t. Windows firewall service is not running at all. And I can enter only myself if Sharing is enabled on PE Network. In other direction sharing is not possible also even if enabled on PE Network. Are there any differences in SMB services on Windows 10 or something is missing from this compilation ? And finally. I access myself using PE by name. By IPv4 address error is the same. Not found! I guess SMB client on this PE works only over IPv6 or something like that. Bro thank you so much. Love your tool set. Noticed you only put the active suit on the x64 version. Do they not publish a x86 version anymore? Amazing program. Best $100 ive ever spent…..
What a great release (Win10). I have a question. Is it possible to incorporate all the software into the boot.wim file. I’m trying to boot it in Windows Deployment Service. I have extracted the boot.wim from the ISO file. Problem is that all software shortcuts are pointing to drive “Y”. Some of my earlier builds had most of the apps in the boot.wim. You can try one of those. I stopped doing this because it requires more ram and makes it difficult to update the apps. I may create a build specific to WDS just not sure there is enough demand to warrant my time. If anyone want to have this just reply YES to this message. yes / or could you please tell us how it is done? Macrium Reflect need to be updated to v6 since the exist ver cause troubles and gives error. My soon to be released build includes Reflect 6.1 and Acronis 2016. I have a question….I downloaded the ISO file and used the microsoft Windows 7 USB DVD Download Tool to burn it into a USB flash drive….It all worked fine but when I’m booting from this USB drive I get a massage saying….Windows need to repair your computer. any idea ? I did the same process withe the 8.1 ISO file and it’s working fine. You may have some bad blocks on your usb stick. Try using Rufus instead and be sure to check the box that says “check device for bad blocks”. I did, No bad blocls and tried on 3 different drives. maybe the burning tool is not good for this action ? I use this bootable USB Magic solution from Gandalf daily, fix most of my problems and solutions, waiting in great anticipation for a follow up on the great 32/64 bit dual boot, with related great tools set included! Great work and a great site. Thanks a million, Gandalf! for some reason the system will not boot anymore. 1 The search function is not working at all. “…item does not match your search”. and cmd admin ownership takings etc etc. same applies to the receycler folders. And that was actually my main aim looking for a 64Bit PE. Any suggestion in that matter will be utmost welcome. the stiff little blue window is really boring. i am dumb like a dead horse with computers and wanted to make room for more data and deleted my Linux’s partition. Then, obviously, grub changed my boot and i got stuck unnable to acess windows. Any tool here will fix this to me? You could try Smart Partition Recovery or Active Partition Recovery. They are not on every build so make sure the build downloaded has one of those. Pro stuff made by a skilled pro. Thx a lot ! Hi, can you send me the link as well? very useful site btw, keep up the good work! Hi Gandalf, it’s awesome that you put together recovery tools like this for us to use like this..
A question though, is there a reason you chose not to add GHOST into the mix of applications?? And I’ve come across an issue with a laptop where I used the bootable PE disk but the file explorer did not see the portable USB drive that I wanted to send the image to. (It’s a DELL Laptop with a UEFI type BIOS and a SSD hard disk)..
Hello and thank you for this! For some reason, the mouse doesn’t work when booted up. Any ideas? First time I’ve heard this issue. What kind of mouse? USB, PS2, touchpad?